There I was, at 10 o’clock at night, wandering the streets of Gothenburg in the dark, with an 17kg sack (which is heavy) of biochar straddling the handle of my wheelie suitcase thing, lost, tired, and wondering what on earth I was doing. It wasn’t the plan. Someone was meant to meet me at the station, carry the bag, and show me where I was staying. But, due to some confusion, it was just me and my bag of biochar. “One day”, I thought, desperate for my bed, “I will be able to share this and to laugh about it. One day. But certainly not today”. When I finally arrived at the hotel, exhausted, and delighted to no longer have to drag biochar around the city, the receptionist said “what’s that?” “It’s a long story” I said. But it’s a story I’m going to share with you now. I gave up flying in 2006. I sat in the back of my local cinema, watching the closing titles of ‘An Inconvenient Truth’, glaciers melting and collapsing, and thought “I need to change something. I don’t want to leave this cinema the same as I came in”. So together with my wife, we decided to give up flying. In the 11 years since then I have flown just once, a trip to the US to meet with many of the key environmental funders there, and also, seeing as I was already there, an extensive speaking tour. There was much debate about whether to fly there or not. In the end we decided to, and 2 years later we calculated the pros and cons and found that we had used 5 tonnes of CO2 to go there and back, but had saved 20,000 tonnes through the work we were able to unlock the funding for. It didn’t offset, or compensate for the carbon released to get us there, but it was, on balance, worth doing. Initially the trip to Sweden was designed to end in time so that I could get the train down to Mallorca, where I was due to speak at the Education for Life conference. It would have been a 4 day train journey. But then Malmö, Uppsala and Copenhagen asked very, very nicely, “please, please, please, you’re in Sweden anyway, please come and do a talk for us”. I said that I would, provided that the organisers of the trip were able to think of a creative way in which we could raise awareness of the seriousness of the decision to fly and, while ‘compensation’ is not really possible (once carbon is released it’s released), it would be great if they could think of a creative way to do something good as a result. With tour organiser Niklas Högberg, and a bag of biochar. Biochar is a material produced in Sweden from forestry or agricultural waste which, rather than being burnt, is turned into charcoal, which locks the carbon into the material. The carbon is mixed with mulch which turns it into a highly effective nourishment supply for the soil. This is how Terra Preta, the “black soil” in the Amazon, was made. The organisers calculated that the flight was equivalent to 417 kg of CO2. This equates to 245 kg of biochar. Every Swede produces, on average, 11 tonnes of CO2 per year, which is 30kg per day. So each citizen, to lock up biochar equivalent to what they emit, would need to bury 17.7kg, that’s one sack per day. Perhaps if they were told they were going to have to lug it around Gothenburg like I did it might provide more of an incentive to reduce emissions! That could be an approach to discuss at COP23 right now. If Donald Trump had to carry biochar equivalent to his daily emissions around with him all day, he’d soon change his tune. Possibly. Then, in the talks, I said at the end something to the effect of “if you’ve found this talk inspiring, or valuable, please use it as the impetus to do something, to resolve, like I did in that cinema in 2006, to change something, to cut your emissions. That will at least enable me to feel like the trip was worth it”. As well as the sacks we buried in each city, next Spring, 245kg of biochar will be buried on a farm in the south of Sweden. The science on adding it to soils suggests that in soils that are already fertile and in good shape it is of negligible benefit, but if added to poor, sandy soils, it can be a great source of fertility, water-holding, and of acting like coral reefs for beneficial bacteria. 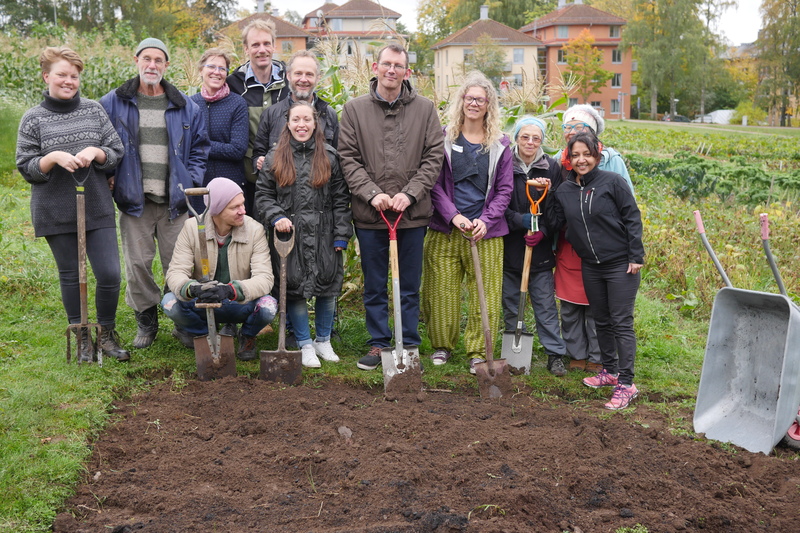 Awareness was raised in each place about why this crazy English guy cared so much about the carbon implications of flying that all these people came together to help him bury a sack of coal in the ground, and to cart one round Gothenburg in the dark. It was quite a news story in Sweden, rather like when Tony Hawks hitchhiked around Ireland with a fridge. It was a symbol of a sustainable future, with healthier soils, a post-fossil fuel agriculture and resilient local economies. It created the opportunity to have those discussions about how that might be and what it might look like. So, on balance, worth doing? It’s your call really. Hard to say. It was certainly a great way to communicate a Transition story of being aware about flying, of it being a big deal, of linking that to healthy, vibrant, resilient soils and to post fossil fuel farming, and its connection to vibrant, connected communities. And I have to say, as someone who has spent the last 11 years getting trains everywhere, from Totnes to Venice, Stockholm, Barcelona, the Austrian mountains, they are so much more enjoyable than planes. When the actual flight came, due to how exhausted I was by the end of the trip, it really was not very enjoyable at all. The last element here is, as I just mentioned, just how exhausted I was by the end of the time in Sweden. Every place I visited thought this might be their only ever opportunity to host me, so planned super-packed days. I think that the 4 day train ride down to Barcelona could have finished me off altogether. Sometimes paying attention to personal sustainability also has a role here?